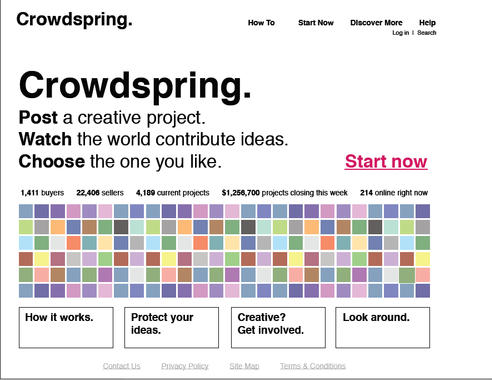 Crowdsourcing sites need to make room for yet another entrant: crowdSPRING. 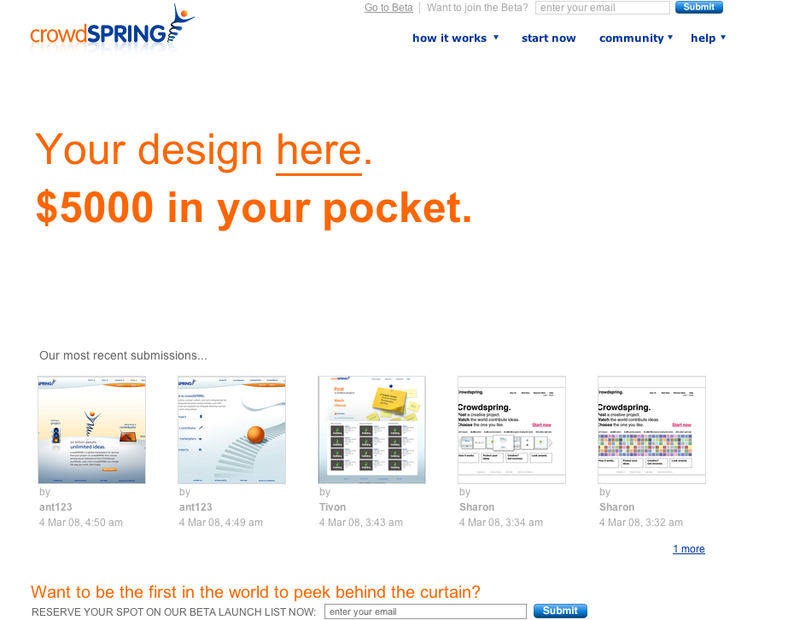 The site is in private beta right now and is starting off with a $5,000 prize for the best design for its homepage. The first 500 TechCrunch readers to sign up here will get into the beta. (The public launch will be in April). 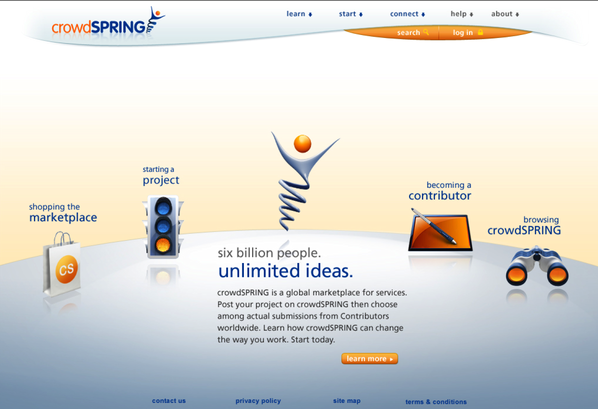 CrowdSPRING is very similar to other crowdsourcing sites like Kluster, Cambrian House, and FellowForce. It offers an online environment for people to collaborate and contribute new design ideas. Companies can set up challenges with prizes to see what the crowd comes up with. 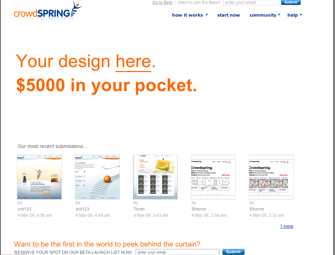 CrowdSPRING is focused primarily on creating logos, Website designs, and marketing materials. “What we believe is that there is a huge pool of talent out there that is untapped and cannot compete effectively in a traditional model,” says co-founder Mike Samson. 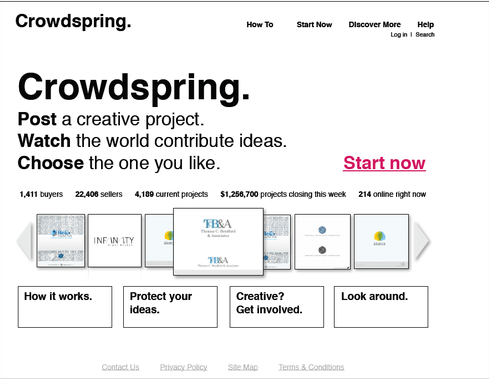 To choose the crowdSPRING logo, for instance, Samson and his co-founder Ross Kimbarovsky created a contest. After they selected the winning design, they found out it was created by a 28-year-old janitor in Ottawa who taught himself graphic design. How CrowdSPRING differs from most other crowdsourcing sites is that contributors must put up completed works, not just concepts. It is not so much about people working together to improve a single design, but rather to put up their own work in competition with everyone else’s. (See my recent write-up of Kluster, for a comparison of how a more collaborative approach can work). Since everyone can see everyone else’s project, they are still informed by each other’s work. “A funneling effect takes place,” says Kimbarovsky. This avoids design by committee, while still allowing one design to inform another. But it may also discourage the most talented contributors who might value their time too much to whip up an entire design for free before knowing whether there will be any takers. Intellectual property protections are built into the system. (Samson is a former trial attorney). Your design belongs to you until the company that set up the challenge decides to buy it. CrowdSPRING takes a 15 percent fee. The company is based in Chicago and has raised $3 million in angel funding. Come up with a better Website design than the ones below and you can win $5,000.